July has been cold, and apart from one warm week, we had the fire going every night. The dogs sleep outside, but they wear at least one dog coat each (here's how I sew them). We even had a bit of rain, only 10-20 mm here and there, but better than nothing and the grass is looking very green for this time of year. Gus is getting bigger, now around 30 kg and I really need him to learn how to jump on the back of the ute. Taz can still get him on the ground in a doggy wrestle though. He's booked in for neutering on Wednesday morning. We butchered six of the roosters one morning. The place is so much more peaceful without all the crowing and chasing hens. Plus they taste great, nothing like shop chickens! (here's how we cook them) We had a roast chook and then made a huge batch of chicken stock. Not much to report on the farm, but I we have been keeping an eye on the bees. One hive was looking a bit weak, so we transferred the frames to a nuc box (half size) and added a frame of brood from another hive, they are looking good now. I went through my beeswax collection (I buy it from markets when I see it cheap) and melted the big blocks so that I could pour it into icecube trays for more manageable chunks (its impossible to cut or grate from the big blocks). The darker brown beeswax is from old combs, it contains more honey and pollen. The bright yellow is from "uncappings" when you cut the tops off the honey frames to extract the honey. Both are great for making salves (here's my salve recipe). We took the dairy cows out to Cheslyn Rise, and despite our best attempts to keep the bull separate (we spent a weekend fixing up the fence and building a new electric fence - here's how we use solar energisers) - he some how managed to get the gate open, so all the cattle got mixed up. 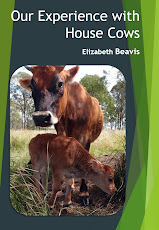 Looks like we will have to make sure we are ready to milk out there in 9-10 months. We still have the baby house cows and Chubby at Eight Acres and feeding them grain to keep them tame and growing strong through winter. The garden is GREEN from the rain and some warm days. All the asian greens have come up and I have to pick them to 'weed' the garden and make some space for the radishes and turnips. This is a very productive time of year. Also coriander, Parsley, Herb Robert, Chickweed, and Sweet Violet are growing well at the moment. We haven't made much progress on the house as we've been focusing on the shed. We needed the shed finished so that we could stack all the furniture in there when we get the floors done.... and the shed was very nearly finished expect for the handrail on the mezzanine floor. 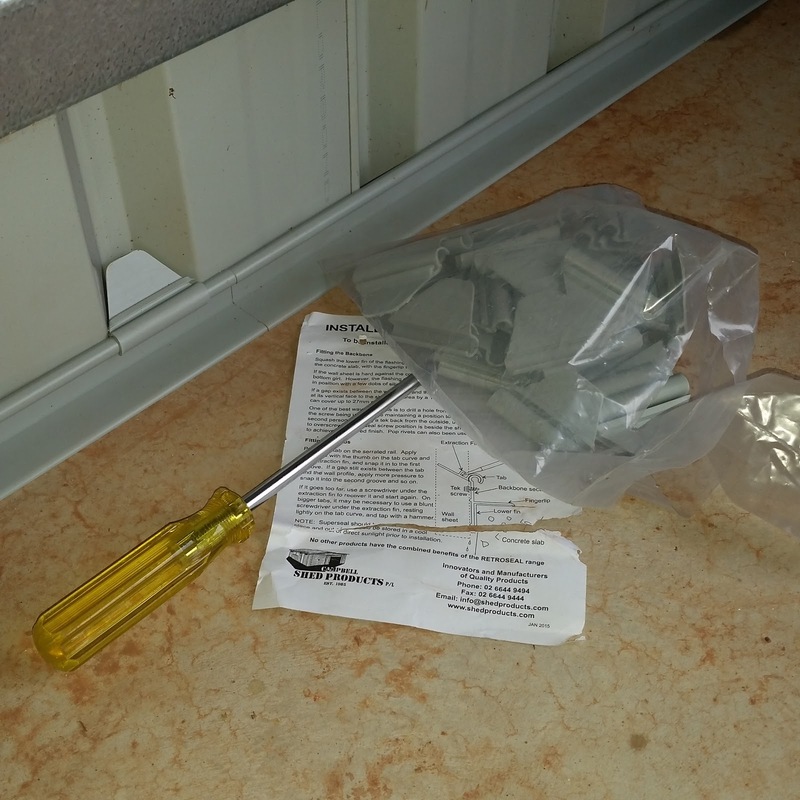 We also wanted to to rodent-proofing as the mice had really moved in there after it was finished. We got council approval for the shed, so now we can start filling it up with furniture until the house is finished. Now back to painting the lounge and last bedroom! AND I have an article about our house move in the latest issue of Owner Building magazine, which is out now. I had a lot of fun working with the team and they've done a wonderful job of presenting the article and my photos. Work with nature rather than against. Make the least change for the greatest possible effect. Everything gardens (or modifies its environment). Work with nature rather than against - anytime you're working against nature you're just making hard work for yourself. Whether you're trying to remove weeds and kill pests, grow something that is not suited to your climate or soil type, you will find it much easier to work WITH nature. Accept that you have weeds and use them for something. Accept that you will have pests and work with them. Accept that you can only grow certain things, but try to find the best option for where you live. Always consider work you could work with nature to reduce effort and input costs where possible. For example, some people can go to a lot of trouble to kill termites on their property. I don't like to see them near the house, but out in the trees they are fine and they break down the fallen wood into soil food. We would rather leave these termites to do their thing than have to clear all the wood and add fertiliser to our soil. This reduces our effort and cost (we don't have to poison the termites, we don't have to cut the wood, we don't have to fertilise). I tried the salt soap again and it worked. We cut it 2 hours after pouring, it was still hot, but it was solid enough to cut and stamp. Its made a very hard white soap. I didn't put any essential oil in as I just wanted to get the salt part right. I got a book called Scientific Soapmaking: The Chemistry of the Cold Process (Affiliate link), which I'm halfway through and has been really good so far. I'll do a full review soon. 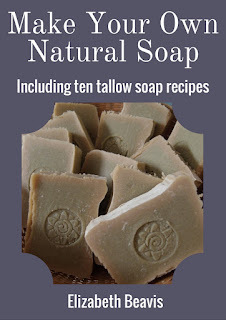 Also see my guest post on Say Little Hen about simplifying soap making. 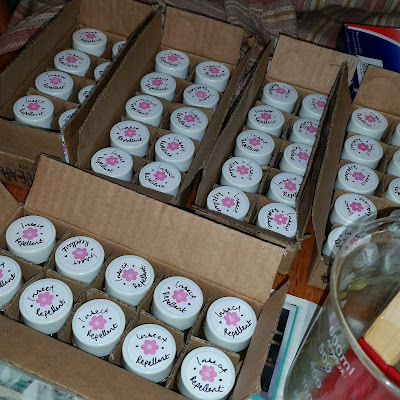 I had an order for 50 small jars of natural insect repellent for a wedding! I had to write out all the lables, I really hope they are appreciated by the guests, as the neem is a bit stinky, but better than getting bitten by mossies. Its really fun to see how people are using my little homemade products and I enjoy getting custom orders. I don't have any new blogs to share this week, just haven't had much time to look around the net, so if you have any suggestions please share in the comments, I love finding new blogs to follow. Lots happening there, Liz. Our Herb Robert has taken over at the moment as it really loves the cool weather. Another warm day for us here before it starts to cool down again. Love the hi five with Gus. Be careful with him jumping into the back of the ute though, and jumping down again. If he looks hesitant, there could be good reason for it. I can't remember his exact breed, was it bullmastiff cross something? My brother had a pure bullmastiff - he was gorgeous, but he died young (about 3 years) because their bodies are just too big for their ligaments and organs to cope. Hopefully, being a cross however, Gus's other genes will reduce his potential size. We used to have a Rotty crossed with a German Shepherd, and both breeds were known for having hip displacement problems. So we always made sure we didn't put her in situations, which would jar her ligaments. She never had any problems in that department. Luckily all the cars she drove in, were low set wagons. The rest of your property looks great and I couldn't agree more with your thoughts on termites. I would second that for ants too. We only keep the immediate areas around the house free of ants nets. The rest of the land is theirs' otherwise. Because ants are a natural control mechanism for termites. If they can gain access to a termite mound, they will eat the occupants. Never enough to decimate the population, but they control their numbers nonetheless. Great update I wish I had a veggie garden. So glad the salt soap worked and that is a great order for insect repellent balm.